At the time of publication, the Schiller Coastal Studies Center, the Schwartz Outdoor Leadership Center and Whittier Field Grandstand are the only campus buildings still without power. The College lost over 60 trees during the storm. 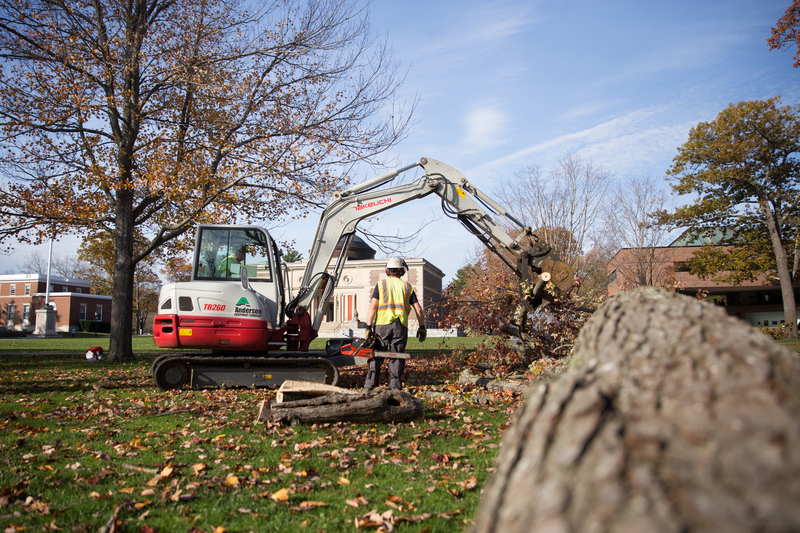 The three fallen trees on the Quad will be cut up and used to provide heat for the Bowdoin community and others, according to President Clayton Rose. The fallen trees did not damage any buildings. According to Senior Vice President for Finance and Administration and Treasurer Matt Orlando, the only structural damage was to a few fences. Further, no injuries were reported. Despite the lack of structural damage to the College, the storm still made its presence felt on other parts of campus. The basement of Burnett House experienced minor flooding, as did some rooms in Coles Tower. Senior Lucia Gibbard’s bedroom in the Tower flooded early Monday morning, and many of her belongings were damaged in the process. According to Gibbard, the College has already paid for her laundry and will likely reimburse her for any of her possessions that cannot be fixed. In addition, many of the residents who live on higher levels in the Tower were without running water starting Monday. According to Associate Director of Safety and Security Dave Profit, this is because the water pressure only goes as high as six floors, and the auxiliary pumps that push water pressure higher are not tied to the Tower’s generators. After realizing the intensity of the storm’s effects in the early hours of Monday morning, Orlando, Safety and Security and Facilities worked to clear roads and paths, communicate with Central Maine Power Company and set up limited power generators around campus. As needed, portable generators were dispersed around campus in addition to the permanent generators located at Thorne, the heating plant and the communications center in Rhodes Hall. The campus power grid is divided into two separate loops, which are roughly delineated by College Street. A number of residential halls, Coles Tower and Hawthorne-Longfellow Library are on the south loop, to which power was returned on Tuesday. The majority of academic buildings and a number of first year bricks on the Quad, which are part of the north loop, had power restored late Wednesday afternoon. Other buildings farther off of the Main Quad, such as the College Houses, have stand-alone service from CMP and regained power midday Tuesday. Bowdoin, along with the rest of Maine, continues to work to resolve follow-up issues from the storm. As of publication, 68,000 customers remain without power, according to CMP’s website. The College plans to debrief its response and update protocol for the future. In order to ensure the safety of the hundreds of people who stayed past operating hours in Thorne on Monday night, the Office of Safety and Security continuously posted at least one officer in the dining hall throughout the night. One of the biggest safety issues was making sure that students could move around campus safely. According to Nichols, Safety and Security had almost triple the normal amount of officers on Monday night, many of whom were working extra hours. Securing buildings was an additional concern. Because the card access system is run by batteries, which can run out from overuse, Safety and Security took extra measures to make sure that students were able to get from building to building. This included closing academic buildings after 5 p.m. on Monday and Tuesday, propping open certain frequently-used doors and posting extra officers. On Monday morning just after 7 a.m., the Dean of Academic Affairs Elizabeth McCormack announced that all morning classes were cancelled until 10 a.m.
“It was really a safety issue because it was completely dark and the roads were not navigable and it was still windy in the morning, so we weren’t sure that all the trees had come down,” said Orlando. Classes later in the day were held at the discretion of the professor. Associate Professor of Religion Elizabeth Pritchard was one of many professors who chose to hold class as usual. “Having taught a Bowdoin class in the Maine Correctional Center (in spring 2014) in which there is no access to electronic resources of any kind (including phones), my view is that so long as there is shelter and light, you can hold a class,” said Pritchard in an email to the Orient. Many professors got creative in order to hold class. 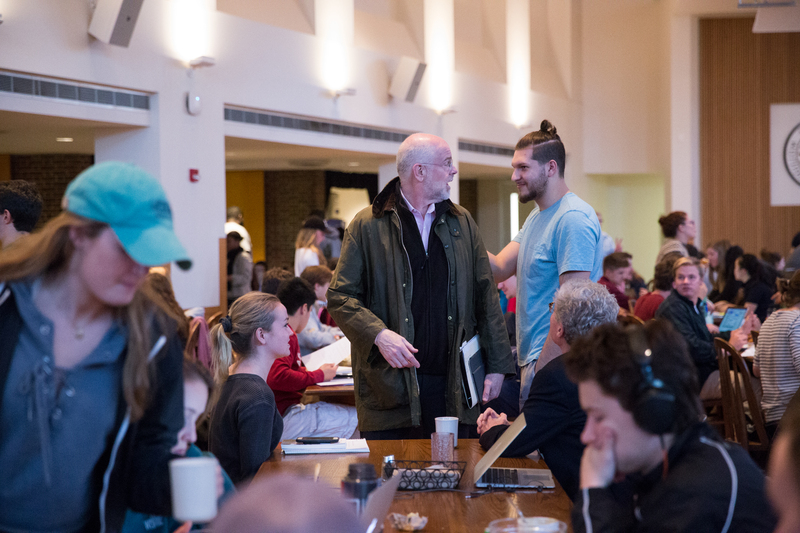 One professor held class in a break room in Rhodes Hall, which houses the Office of Safety and Security, while another held class in the atrium of Druckenmiller Hall.